Another wonderful signature dish from my book ” Heavenly Bites: The Best of Muslim Home Cooking ” avaible from Kube Publishing Ltd ,Tel: 01530 249-230. Alhamdulilah Islam is the fastest growing religion in the Caribbean . I hear of brothers from the UK going back and building masjids and schools etc. Alhamdulilah the Caribbean is now definately part of the muslim world . Since birth I have eaten curry, even the spices are in the mother’s milk, my Mauritian grandma was the best cook in my world throughout my childhood and was the standard to which my mum’s curry was measured and she did a pretty good job. I have eaten curry all over the world, especially when I was a practicing Rasta, you know like Bob Marley. Caribbean curry is not like any other curry, the spice blend is distinctively different but as far as chilli ratings goes this one’s on a par with vindaloo, made in a similar way by marinating hours before. You can buy Caribbean curry powder but it’s not as good as homemade but that another secret coming soon inshallah. Preparation marinate 3hours before or over night. • Using a knife and fork cut the scotch bonnet pepper into small pieces; you must protect your hands from the pepper which will burn any sensitive skin your hands may touch afterwards like eyes or lips. You could use hot pepper sauce instead of fresh pepper. • While the stock cube and coconut are dissolving add 2 tbs of curry powder to the meat and stir, turn heat down to low medium to cook spices into the meat but not burn them. • Simmer on low medium heat for 30 with a lid on the pot. 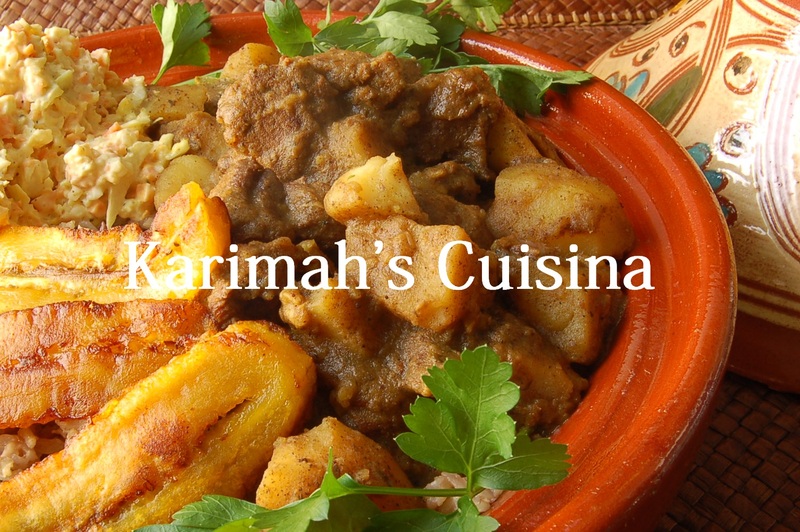 • Turn heat up to medium so that potatoes can boil and cook for 15minutes , then turn down to low for remaining 15minutes, till potatoes are cooked through when tested with knife and are slightly soft, this softness of the potatoes thickens the curry gravy. • Serve with rice and peas, plantain and coleslaw….hmm super delicious…must be from Mauritius! Salamu alaikum…Sounds so delicious…. Do you have any vegetarian dishes for Ramadhaan?? ?